Last year, Mrs Chillikebab celebrated a birthday. A Significant Birthday. So, of course, I bought her a Significant Present. But no, dear readers, it was not that significant. For whilst I think I did buy her a book, and possibly some biscuits, I did not buy her a bicycle. I was very tempted, but in the end just thought it was too risky. Mrs Chillikebab has not owned a bike since she was twelve years old, and not ridden one since we were backpacking in Thailand some years ago. Then, in April, was Mrs Chillikebab’s Significant Birthday +1 year. I ummed and ahhhed quite a lot, and then with only a few days to go before her birthday, it crystallised in my mind. I would buy her a bicycle. The present I wished I have bought a year earlier. I already knew which bicycle it would be. It would be a Gazelle – beautiful Dutch-built bikes high on style and practicality. A bike for riding to the park on, for popping to the shops on, perhaps even for joining me pedalling the kids to swimming. And it would be electric. Mrs Chillikebab is quite fit, but she had previously expressed concern about ‘keeping up’ with me. And new cyclists, even quite fit ones, often find the hills a struggle until they get used to using some new muscles. Oh, and electric bikes are just very very cool. 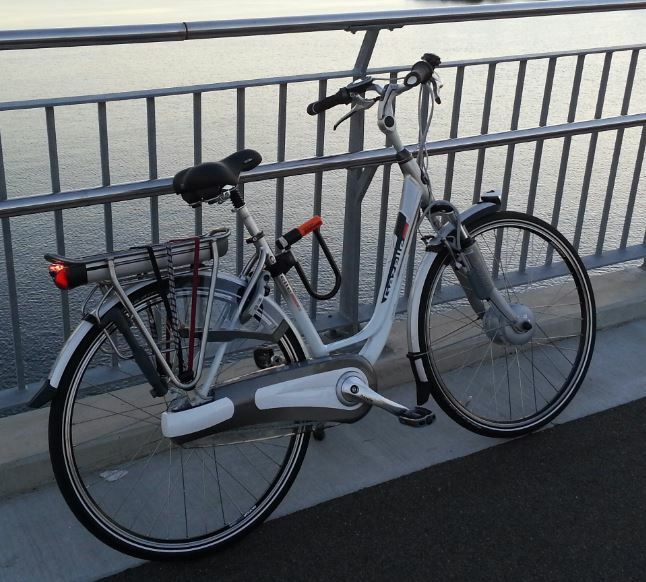 Buying such a specialised bike, in the right size, with less than 48 hours’ notice was a bit of a stretch, I suppose, but the good folks at Sydney Electric Bike came through for me. I daresay it was one of their more unusual sales – I don’t know how many frantic calls they get from people wanting a bike the day after tomorrow (no test ride isn’t important, yes I can come over tomorrow morning), but I suspect it’s not many. So the evening before Mrs Chillikebab’s Significant +1 birthday I picked it up to ride it home, leaving my fixie at the office. I didn’t want to arouse suspicion when I got home, so wore my usual fixie riding clothes , which I daresay looked pretty odd on a sedate, step-through bike. So what’s it like to ride, I hear you cry? Well, it is fantastic. You start to pull away, and then this magical force kind of scoots you along effortlessly. It’s like riding with a really strong tailwind all of the time. You do have to pedal, but the hills flatten out and on the flat you cruise along at a good pace with very little effort. I’ve long been a believer in electric bikes being the future, but actually riding one really reinforced that view. These things are awesome. Anyone who resists riding a bike because ‘there are too many hills’ or ‘I get too sweaty’ should ride an e-bike. There really is no excuse. All the fun with none of the pain. The actual bike itself is beautifully built. From the lights moulded into the mudguard to the satisfying ‘click’ of the manual handlebar adjustment, the whole package just oozes quality. If I have just one minor gripe it is that the battery rattles slightly in its holder – but I will forgive that as the way the battery slides in and out of the holder on moulded rails is a joy to behold. The riding position is sitting up. Really sitting up, not ‘sort of leaning forward’ which is the posture you need for most Australian city bikes. The handlebars are right there up high, and the saddle is quite high too. It’s almost like riding a horse – you have a very commanding view of the road ahead. It’s very pleasant, especially with the motor helping to scoot you along. I felt like royalty – perhaps why the full name of the company is ‘Royal Dutch Gazelle’. I safely stowed the new bike in the garage undetected, and went in. The next morning, I got up with the kids so Mrs Chillikebab could have a birthday lie-in, and put the Gazelle in the middle of the lounge with a large ribbon and bow around it. The kids were quite interested, and seemed pleased that Mummy was going to have a bike too. ‘Then we’ll all have a bike!’ Chillikebab I said happily. In due course, Mrs Chillikebab emerged and came into the lounge. She started saying something, and then the bike caught her eye. She fell into shocked silence. So was this the start of a lifetime of cycling en famille, or an expensive white elephant? Look out for Part II of this blog next week to learn what happened next! Ever since Little Chillikebab got her first bike, she’s gradually getting better at riding it. She’s been riding it to the park sometimes, with me walking along. Whilst she still shuffles along a lot of the time, she is starting to get the hang of scooting along so the bike rolls while she lifts up her feet. As she’s getting quite proficient, when I needed to pop to the shop, I suggested that she could ride her bike, and I would ride mine too. She seemed quite excited about the idea of both riding, so I got her bike out of the garage and told her to take it to the end of the drive whilst I got the Radish out. I glanced down the drive to see Little Chillikebab waiting for me at the edge of the curb, ready to go into the road. She looked back at me with a puzzled expression. 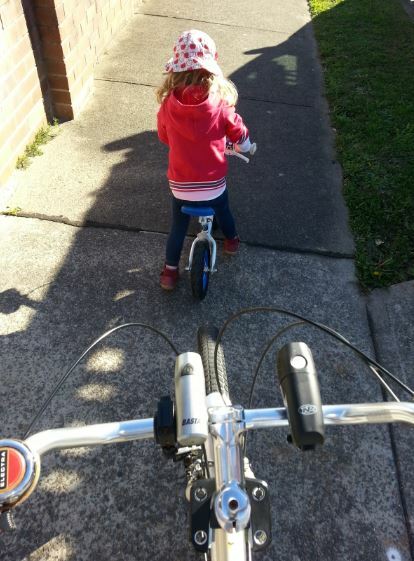 “But bikes go on the road, Daddy!’ she said plaintively. This was a problem I had not foreseen. Apparently years of ferrying her around on my bike has turned her into a committed vehicular cyclist. After some discussion (she was not ready to give up on the riding on the road idea easily) I convinced her that it was OK to ride on the pavement, and off we went. She did really well. It was quite a challenge for me to ride that slowly, but we got there. I was expecting her to give up or get tired, but she rode the whole way – about a kilometre or so. It’s mostly on a barely discernible downhill, which certainly helps, but I was very proud. My first bike ride with my daughter! 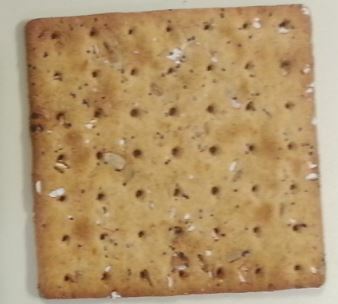 We continue our odyssey into the Arnott’s savour biscuit range with a look at the Lunch Slice. These come in a couple of different types but it was the poppy, sunflower and rye version that arrived on my desk one slow lunchtime. So how would they go? Would my lunch be a symphony of glorious slices, or something more mundane? It’s worth noting that these biscuits are quite big – perhaps 10cm square. You get two individually wrapped packs in each box – so you can keep half the pack fresh for lunch another day. I tried them loaded up with sliced tomato and cheese, as well as au naturel. They were actually pretty good. Structural integrity was excellent, which means you can take a bite out of the biscuit without the remainder splintering into pieces and depositing tomato slices on your clean shirt. They handled the tomato test well too, without a hint of sogginess from the tomato juice marring the texture. And they taste OK to. With a topping they actually are pretty good; when eaten on their own they have a hint of ‘burnt cooking oil’ about them – perhaps from the sunflower seeds. It’s not overpowering though, and you can actually just eat them alone as a fairly satisfactory snack. The only disappointing thing about them is the ‘Vita-Weat’ branding. Usually Arnott’s are very good about this kind of thing, but in this instance they seem to have omitted the ‘h’ out of ‘wheat’. Perhaps their spell-checker was broken on the day they designed the packet. I’m sure I’ll have them again – I’m going to give them a six out of ten.